A what-choke? A sunchoke. What’s that? Wikipedia says that “despite its name, glaucoma the Jerusalem artichoke has no relation to Jerusalem, sale and it is not a type of artichoke, even though both are members of the Daisy family.” Does that help? No. Ok – Sunchokes are basically root vegetables. Like a cross between a potato and a rutabaga. They look weird (kind of like ginger root) but taste amazing. Better than potatoes. They’re also simple to prepare. Just give them a good scrubbing, peel them as best you can and toss them into a covered casserole dish with olive oil, garlic cloves, salt and thyme. Into the oven for 30 – 45 minutes and your whole house will smell wonderfully of garlic. And if you make these before you go to work, you too will smell wonderfully of roast garlic. All day. I should know. If you’ve ever seen these at the grocery store or farmer’s market and thought – what on earth can I do with those? This is your recipe. And if you can’t find sunchokes, or the thought of them creeps you out, just use potatoes or any other tuber. Because there’s nothing better than something roasted in garlic oil. Preheat your oven to 375°. Scrub your sunchokes until they look pretty clean, then peel them with a small knife or vegetable peeler as best you can. No need to go crazy here – just get most of the peel off. 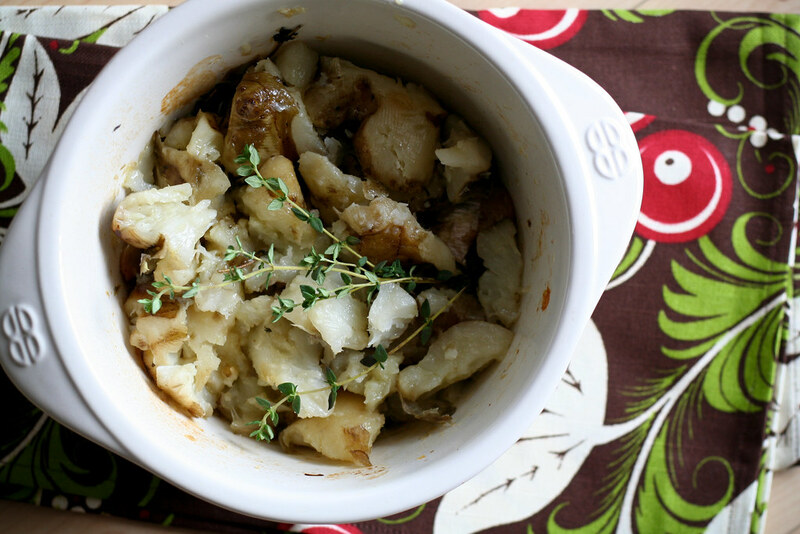 Place the sunchokes into an oven-save casserole dish. Cover with the remaining ingredients and give everything a quick stir to make sure the sunchokes are coated. Bake for 30 – 45 minutes, stirring occassionally (time will depend on the size of your chokes). They should be fork-tender (like a potato) when they’re ready. Mash them up a bit with a fork or potato masher and serve. You are doing a wonderful job. Not only the recipes but the pictures are also very very attractive. Speaking of sunchokes, we have many ways of using them in my country (Turkey). We have a vast variety of olive oil dishes and sunchokes are one of the many vegetables we cook that way. It has a base that apply for all the olive oil cooked vegetables. First chop some onions (a medium one will be fine) and stir fry them in two tablespoons of good quality olive oil. If you like add half a minced carrot and keep stirring until the onions become transparent. Since you have this base you can cook lots of vegetables adding to it. For the sunchokes, a big potatoes, peeled and cubed goes well with it. Wash, scrub and peel the sunchokes (about a kilo), divide them into “cube like” pieces. Cube the potatoes and add them all to the pot with the addition of a glass of hot water. Add salt to your like and be sure to add a teaspoon full of sugar. Bring to boil and cook on low heat for 40 minutes. (since they played with the genes of whatever we eat, every vegetable has different cooking times then before. I live half the year in Istanbul and half the year in Montreal and for ex. while potatoes cooks quicker in Montreal, cauliflower cooks quicker in Istanbul!) Anyway, so check the cooking state of them after half hours, you don’t want them mashed. When they are cooked, chop half a bunch of dill, sprinkle it all over, add two more table spoons virgin olive oil and let it cool in the pot. When its at room temperature its time to eat. You can keep the rest in the fridge, but always bring to room temperature before you eat. Ä°mportant note: I always steal a little from fats, oils and sugars, so I have to tell that it’s gonna taste better with a little more of oil! Another and more simpler way of consuming sunchokes is just wash and rub them, don’t peel(about half a kilo). Slice them thinly. In a big cup mix together a glass of water, one lemons juice, half a glass red wine vinegar, one full teaspoons of each salt and sugar. Mix the sunchoke slices with this blend, cover and let stand in the refrigerator for an hour. Drain and eat as a delicious, healthy snack. Bon apetite! Your blog is always so beautiful, and always introduces me to new ingredients. Thanks so much. LOVE sunchokes. i usually make them like mashed potatoes, but i’ll have to give this a try. ‘Tis the season for sunchokes—I ike to roast them with fennel too. Pureed in soup=heaven! I found you on tastespotting and made these for dinner last night – oh my gosh they were SO delicious. I didn’t really have high expectations for them but wow! Thanks for the recipe I hope you don’t mind if I blog it and link to you! One way to measure the hegiht of something tall is to measure the shadow, measure the shadow of a ruler or short stick at the same time and do a proportion: shadow of ruler/ruler length = shadow of jerusalem artichokes/ x. Solve for x. (I think I got that okay but I’m open to correction. It’s 40+ years since I did algebra.) I would also mention that jerusalem artichokes may present digestion issues for some people so I would cook some from a store before committing to growing them.